﻿ Interested to Buy a Small Size Oil Pressing and Refining Line? 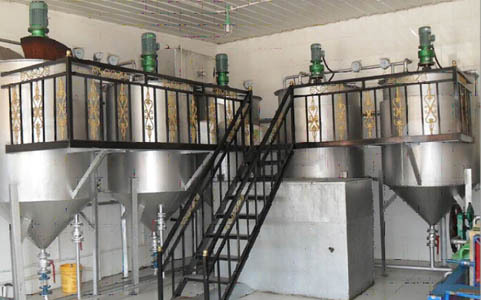 Our small size oil pressing and refining line can process varieties of oil seeds and nuts, such as peanut kernels, rapeseed, cotton seeds, sunflower seeds, corn seeds, palm kernels, and sesame. The small oil pressing plant only need small investment, fewer land space, but with the complete function of the production. A low initial investment, higher output and lower labor requirements. Oil refinery plant including a series of refining processes which are aim to remove phospholipids, FFA, pigment, gums, waxes, off-flavor and other impurities from the oil. To impart uniform color by removal of coloring pigments and to get rid of unpleasant smell from the oil by removal of odiferous matter. The small oil refinery line can change different kinds of oil easily, full function but needs less space, it is easy to operate, transport & install, it is light and movable. Welcome to contact us anytime you feel interest in setting a small size oil pressing and refining line, we are always at your service!